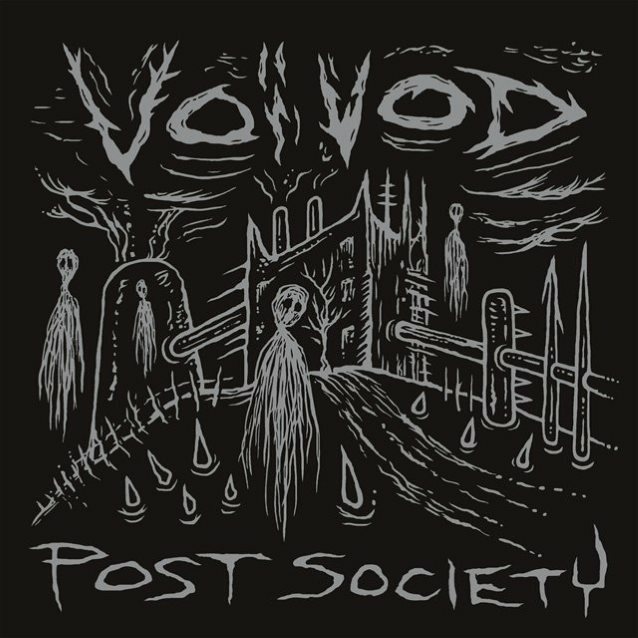 Canadian metal innovators VOIVOD, who recently toured Europe as part of the "Deathcrusher 2015" run alongside CARCASS, OBITUARY and NAPALM DEATH, will issue the "Post Society" EP. This special release will be available on digipak CD and as a digital download on February 26 via Century Media Records. The "Post Society" EP, with artwork by VOIVOD drummer Michel "Away" Langevin, contains five studio tracks, including the previously released vinyl-only new VOIVOD songs from the split seven-inch EPs with labelmates AT THE GATES and NAPALM DEATH, two brand new songs and a HAWKWIND cover ("Silver Machine"), for a total playing time of 30 minutes. Langevin commented: "More songs from out in the woods! "In between tours, we are steadily finding our way through recording the next album at RadicArt studio. "Many riffs were composed on the bus, but until the North American tour with VEKTOR in 2016, we will spend most of wintertime in Montreal writing another batch of material. Meanwhile, we hope you will enjoy this EP of good old thrash-prog-punk-metal or whatever people want to call VOIVOD nowadays." Regarding the musical direction of the new VOIVOD material, singer Denis "Snake" Bélanger told Metal Wani: "It's a bit different, I would say. But VOIVOD has always been doing different things each time. But it has its own signature with the new bass player, Rocky [Dominique Laroche]. He brought new elements to it, I think. It's different than [2013's] 'Target Earth' [album], but it's still VOIVOD." Snake also talked about the passing of VOIVOD's original guitarist Denis "Piggy" D'Amour and the eventual addition of Daniel "Chewy" Mongrain prior to the making of "Target Earth". He said: "Of course, the loss of Piggy was a terrible thing. We couldn't do, really, anything for two or three years; we didn't know what would be the future of the band. And we finally found a guy [Chewy] that could play VOIVOD [music]. And it's sort of a mixture of circumstances that happened. It's, like, 'Okay, maybe there's a light at the end of the tunnel. Maybe if we pick up this guy who learned, actually…' The first thing [Chewy] learned [to play] was VOIVOD. The first show he saw was VOIVOD. And the [day after] he saw VOIVOD, he bought a guitar and started playing Piggy's riffs. So, for us, Chewy was the best option." Snake praised Mongrain's contribution to "Target Earth", saying that he was "quite surprised" with the material that the guitarist penned for the album. 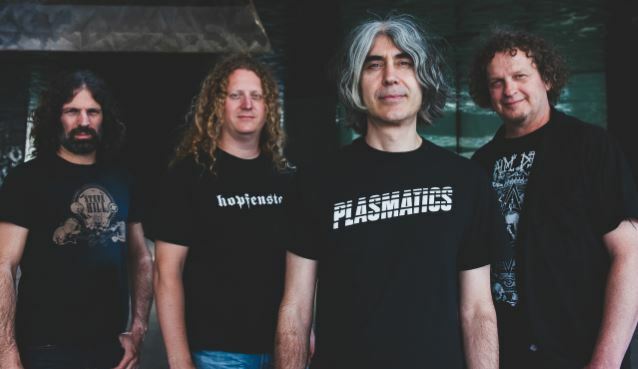 He explained: "It's one thing to play VOIVOD's songs, already written songs, but to create new songs…"
He continued: "I think what [Chewy] wanted to do [on 'Target Earth'] was just compose music that VOIVOD fans want to hear. And so he did. And Piggy's spirit is really there. You can tell that it's surrounding the whole picture. The essence is there. But [Chewy] has his own thing as well. He's a different human being." VOIVOD has announced the first leg of its next U.S. tour, starting in February 2016, with support from VEKTOR and EIGHT BELLS. "Target Earth" was released in January 2013 via VOIVOD's own company, Iron Gang Factory, and Century Media.